Winter. Nights that never end. Voices hovering on cold, chilly winds. Silent, bright days where wide, open spaces hold secrets on the horizon. This is the time of year when ghost stories used to be read around the fire, a tradition that has slowly died out, leaving an air of sadness behind. So let it be a time of year to hide inside with short films that crackle nervously with nostalgia, that rustle like crumpled bedsheets, that hum like electricity in the wires. Films that also linger long in the mind, just like that man in a black hat who keeps appearing and disappearing on the coast, on the screen, and in my dreams. I have spent my December with the BBC's Ghost Stories For Christmas, adaptations of tales by M.R. James, Charles Dickens and modern writers, recently released as a box set by the BFI. 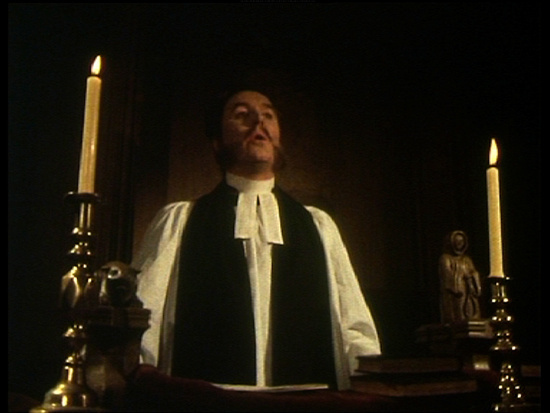 The most famous of these were made by director Lawrence Gordon Clark in the bleak, stark 1970s – The Stalls Of Barchester, A Warning To The Curious and The Signalman – at a time when these experimental half-hours were watched by nearly 10 million viewers. This seems extraordinary now. But back then the BBC was a different beast, as Clark explains on the lovingly put-together extras. “Looking back I was incredibly lucky,” he says. “We were alive at a time when television was still innovative, when the BBC let you experiment with things. There was a feeling in the air that we were in a new kind of medium.” That feeling was a curious, intelligent, cutting and tearing one; it saw creative people burrowing ideas into people's minds, before they terrifyingly untangled them. In our days of BBC-bashing, you couldn't imagine the network ever being as brave again. Still, it speaks volumes that that this box-set broke the BFI first-day sales record. You see, boys and girls, we do like to be scared. To feel the senses heightened. To feel the fight or flight impulses, and a rush of adrenaline. Today, TV usually does something less complicated, pacifying us or provoking us into feeling more obvious emotions. Euphoria, anger, love, hate, whack, whack, what. What's left is the memory of art that did something much subtler, that expressed ideas that had longevity, that suggested richer pickings to dwell on, even deeper, and with terror. The film that begins this set is 1968's Whistle And I'll Come To You, a black-and-white chiller featuring a bumbling academic, Professor Parkin (Shakespeare veteran Michael Hordern), who finds an ancient whistle, which he then blows. Its writer M.R. James, history and archaelogy academic and Cambridge University Vice-Chancellor, was also one of Britain's greatest ghost story writers, putting together three books between 1904 and 1925. He wrote about the lonely scholars that he knew in libraries, museums, or churches, rational creatures fighting forces that they didn't understand. They were usually men stuck in old-fashioned lives, trying to move forward, but struggling with darker warnings from history. The era in which these particular films were made also suits this atmosphere. With the Second World War still a living memory for many, here was the Cold War beating down, the progress of science and technology hurtling forwards, and nature, man's companion, suddenly seeming threatening, uncanny and unreal. These films work so powerfully, so chillingly, because sounds and images are used simply and strikingly; it helped that they were made cheaply on BBC budgets, no doubt. In Whistle And I'll Come To You for instance, just after Parkin finds the whistle on a dune, a black, still figure stands on the beach behind him. Parkin only notices him briefly, and the only sounds we hear are Parkin's feet on the shingle, and the sea. Later, in one of Parkin's nightmares, a bedsheet dances on the wind while a slowed-down voice unfurls like the moan of an animal. Both scenes are done simply; both are utterly horrifying. Primitive tape techniques and synthesiser sounds, courtesy of the Radiophonic Workshop, also unleash menace softly through these films. Electronics clashing against nature: here's those worlds clashing together again. And if you're a fan of so-called hauntology, these soundtracks will be manna and magic to you. A Warning To The Curious (1972) and The Signalman (1976) are the masterpieces of this set, though. The former features Peter Vaughan, fresh from playing the terrifying Tom in Sam Peckinpah's Straw Dogs (he would later be better known as Grouty in Porridge, and more recently as Maester Aemon in Game Of Thrones). Here, he plays Paxton, a very different, broken man, searching for the last lost crown of Anglia, in a setting Gordon Clark describes as a vision of “landscape and light” (Norfolk and Suffolk's wide, silent shores gleam brilliantly throughout so many of these films). The director also adds some political detail to give Paxton's mission a deeper sense of sadness, which works well – a landlord taking his guest's shoes, and noticing their battered, split soles, before spotting a newspaper detailing the three million unemployed, of whom we realise Paxton is one. Later, Paxton fizzes with glory when he finds what he's been looking for, and we feel the weight of those years, in which he felt being belittled and hemmed in, suddenly disappearing behind him. It doesn't last long, of course. Those broad sands, once again, play a part in his downfall, as do the terrifyingly ordinary thuds of an implement that will remain nameless for now. Images from previous BBC Ghost Stories also crop up like spectres – that's proper haunting, alright. Coming four years later The Signalman was a departure for the series, as it featured a Dickens story for the first time. Written only a year after the Dickens survived a bloody train crash in which ten people died, The Signalman's lead is played stunningly by Denham Elliott, a lonely man working in a lonely setting by a train tunnel. He is haunted by voices and apparitions and the fear of an accident, and is visited by a more confident, but nonetheless mysterious man, who we know as The Traveller. The strange atmosphere between the two characters is oddly intimate, even sexual at times, but as Matthew Sweet writes in his liner notes to the film, this is a film about one man's mind, really, not two. “Dickens' story is about the ghosts in the machine of the industrial revolution...[and the] psychological impact of discharging a grave professional duty – ensuring that the lives of thousands of strangers do not end suddenly and violently in a dark, smoke-filled space beneath the earth”. Here again are those old worlds and new worlds threatening each others' borders, quiet lives rubbing together with progress, and dread. Two later, original stories, however – Stigma (1977) and The Ice House (1978) – should not be overlooked. The former is a shocking, mini-horror film rather than a ghost story, showing how terror works horrifically in modern settings. A word of advice: if you have a huge rock in your garden that won't be shifted, even by a digger, then leave it. And once again, it's simple shots and sounds that freeze the mind and the eyes. There's the hook of a JCB framing the mother's face. The sight of her teenage daughter playing, carefree, around the nearby standing stones. A camera following blood cascading off bedclothes. There's also a scene in which the lead's husband (the similarly familiar Peter Bowles) has to pull over to the side of the road in his car. It's an everyday manoeuvre, and an utterly devastating one. Next to Stigma, The Ice House is much more weird and melodramatic, a David Lynch miniature delivered in over-hammy Queen's English. But the isolation of this house in the countryside, the two smiling siblings, the garden's fragrant, overpowering flowers… these are details from ripe imaginations, and from them, come everything. After a few of the 70s films were released on single DVDs, successfully, in 2003, a few 21st century reboots were tried, with mixed degrees of success. Their flaws also offer their own lessons about the Ghost Stories tradition. A View To A Hill (2005) is strong, but Number 13 (2006) features Greg Wise in the lead, who is too handsome and too arrogant to be a bumbling boffin. And if we can't empathise with a character, let alone his fate, then what hope is there? John Hurt is far better in the 2010 take on Whistle I'll Come To You, but the adaptation is so far removed from M.R. James' original, it's like it's dispensing with history for the sake of it. And why? A ring rather than a whistle? A plot about a dying wife that would work far better as a story in its own right? Leaden discussions of what ghosts are, lines delivered like dead weights, and heavy-handed camera angles? All this reminds us that contemporary TV is made for the channel-hopper, with corporations force-feeding us reminders of what we're watching, and why. It's suffocating. The stories are left with no room to breathe, and there is little space for us to breathe along with them. All this also makes me yearn for past times, and for the days before the endless screens, when we properly let our minds wander. Days in which we used to explore coastlines, seas and standing stones properly. When it was just us and the elements, in all seasons, in our own imaginations. Perhaps these films are selling now because this is what people are craving, or because we are living in another time where things are moving too fast. Watching these films, I feel the old worlds and our new worlds clashing and buckling. I also know that we need our stories. We also need our ghosts.